2018 note: transiting Jupiter is semisquare progressed Pallas, as is visible in the chart. I wrote the original post below before making the connection between scandals and Jupiter-to-Pallas transits. California state senator Leland Yee has been a staple of San Francisco politics for over a decade, famous for being a rabid cheerleader for gun control (a.k.a. "victim disarmament"). No more, apparently: the FBI has just arrested him for... yes, weapons trafficking. This is probably shocking to rank-and-file liberals, but libertarians and conservatives consider anti-gun politicians (every last one protected by armed government agents) to be inherently hypocritical. Many of us can't help but smirk when one of our gun-grabbing overlords gets caught red-handed. Positive/libertarian: Mercury, ruler of Pallas, widely conjunct Sun. Negative/authoritarian: Mercury, ruler of Pallas, square Pluto, semisquare Jupiter, and conjunct South Node. Authoritarian, no question. Moon trine South Node and/or square Neptune depending on time of birth. Culturally liberal tendencies exist, even if a time of birth might give us mitigating factors. Debilitated Pallas (see above) square Saturn: a weak Pallas configured with Saturn tends to appear in the charts of gun-control proponents. 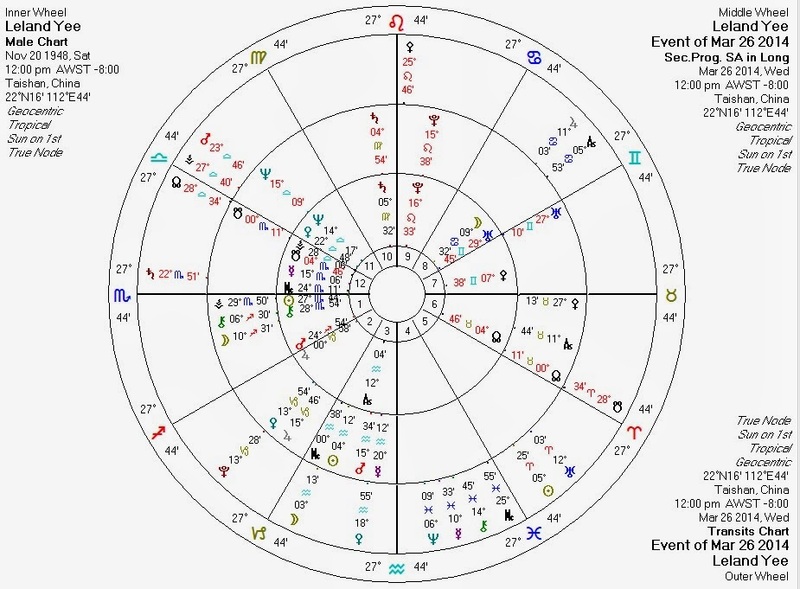 Saturn does not have this effect on Pallas if Pallas is strong (see Lew Rockwell's chart with Pallas conjunct Saturn for evidence). Here's the same chart with transits and progressions for the day of his arrest (time unknown). Progressed Pallas opposite Yee Sun; transiting Pallas square Yee Sun: a strong focus on ethics (Pallas) and weapons (Pallas again). Transiting Neptune opposite Yee Saturn: the dissolution of authority. 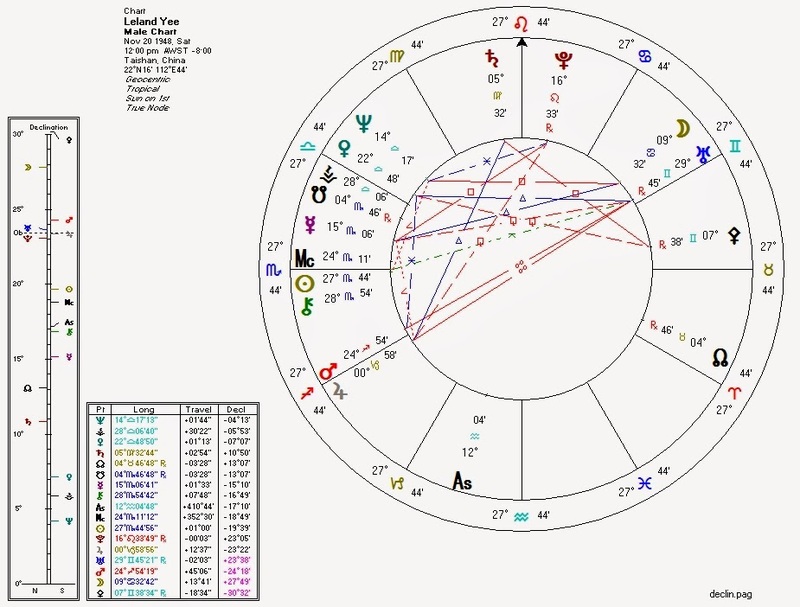 Transiting Pluto/Uranus/Jupiter T-square on progressed Venus in Capricorn and natal Neptune: destruction (Pluto) and disruption (Uranus) of something valuable (Venus), in this case authority (Capricorn). Jupiter adds insult to injury through publicity. The triggering of his natal Neptune evokes the image of his life essentially dissolving away. Transiting Mars conjunct Yee Venus; transiting Saturn semisextile Yee Venus: attack on (Mars) and difficulty regarding (Saturn) that which is valued (Venus). Silly boy -- everyone knows you have to get to the federal level before you can get away with this sort of thing.